Pizza Hut, a restaurant chain owned by Yum! Brands Inc, announced the opening of its 600th restaurant at Times Coast (Shidai Hai’an) in Sanya, a tropical tourist city in China’s southernmost Hainan Island. It is the third Pizza Hut restaurant in Sanya, following the first one in Yalong Bay and the second one in Dadonghai. "Pizza Hut will accelerate its development speed in China," said Perter Kao, brand general manager of Pizza Hut and Pizza Hut Delivery of Yum! China. "We plan to invest more than 700 million yuan ($111.2 million) and open at least 150 restaurants in third- or fourth-tier cities this year." 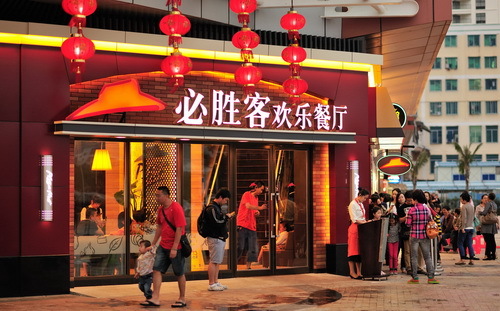 "Last year, Pizza Hut opened 115 news outlets in China’s 139 cities", Kao added.